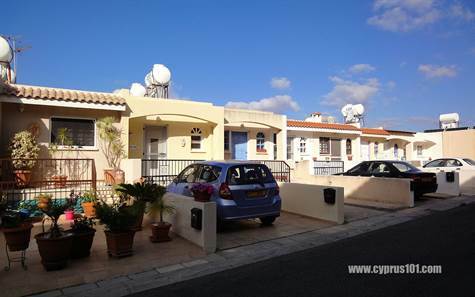 Kissonerga, Paphos, Cyprus - This character 3 bedroom, 2 bathroom townhouse is situated in a quiet residential location in the traditional village of Kissonerga. The property is within easy walking distance to the beach and local amenities. The top floor features a spacious open plan living room with cloakroom, comfortable lounge, dining area and large separate kitchen. Patio doors in the lounge provide easy access to a balcony which runs the width of the property and has the most amazing panoramic sea & rural views. The kitchen is well equipped with cooker, fridge/freezer, microwave and washing machine and from here there is also direct access to the same balcony and breath-taking views and sunsets. Downstairs are three double size bedrooms with fitted wardrobes. The master bedroom has an en-suite shower room and patio doors leading out to a private paved courtyard garden, again with the same wonderful aspect and views. There is a bathroom along the hallway and plenty of understairs storage space. Ideal as a permanent or holiday home, this property comes fully furnished and has full title deeds. Please refer to MLS# 1408 when inquiring.